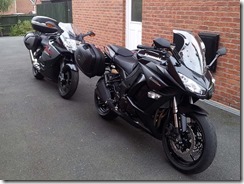 We packed up the bikes after work and left home at around 18:00. We had aimed to get away much earlier but as usual it took much longer to sort things out. It was inevitable now that we wouldn’t get there before dark and would just about make it to the supermarket before it closed at 21:00. 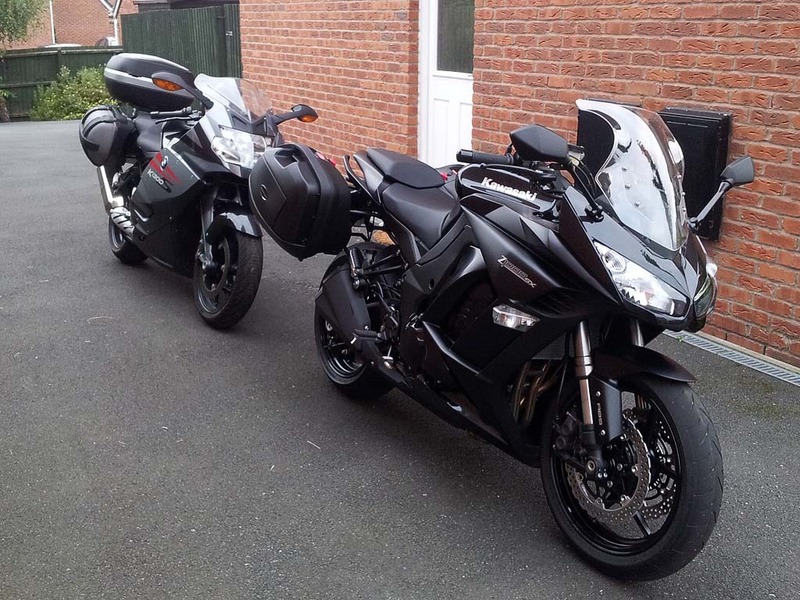 Although we were late we still refused to go up on the M6 as it just a boring slog and not at all fun on a bike. We left home and headed towards Clitheroe on the M66/A56. We cut through Sabden and over Pendle Hill as usual and then headed into Clitheroe. We then left Clitheroe on the B6478 and headed through Waddington towards Slaidburn. I had anticipated that the A65 might be very busy at this time of day so decided that we would join it as near to Kirkby Lonsdale as we could. With that in mind we took Lythe Fell Road in Slaidburn, which heads towards Bentham. It is a minor single track road across some beautiful open countryside. 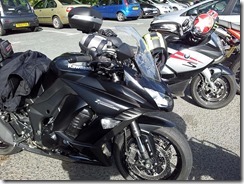 We eventually arrived in Bentham and then continued on more minor roads to Ingleton. Here we joined the A65 and headed for Kirkby Lonsdale. 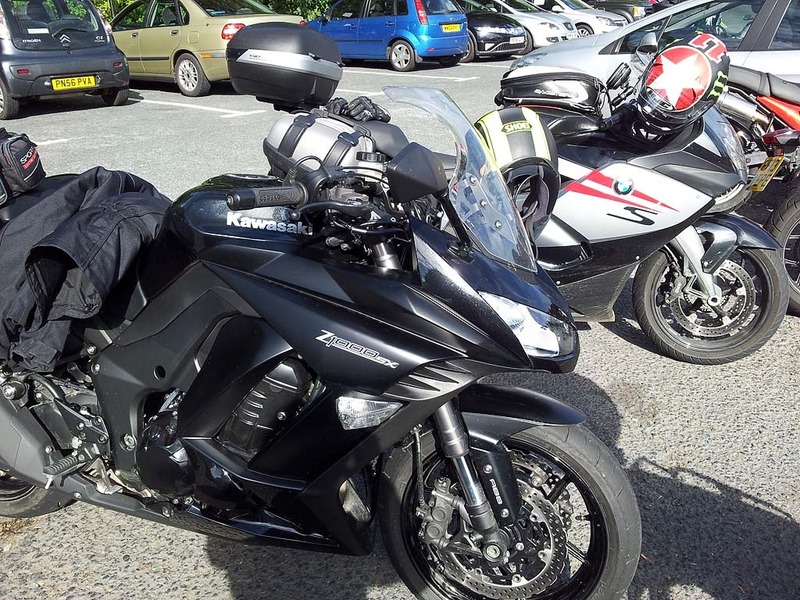 We continued on the A65 passed Kirkby Lonsdale and onto the M6. It was starting to get quite dark now but fortunately we were now on main roads. We passed over the M6 and then followed the A590 towards Ulverston. We soon arrived at our base for the week my Mum’s static caravan in Bouth. We quickly unpacked and headed over to Ulverston to do some shopping for the week at Booths. They have decided to do some roadworks at the A590/ A5092 junction at Greenodd, this no doubt will cause chaos during the day. Due to a poor weather forecast for Cumbria today we decided to head East for some dry weather. This inevitably meant that we would be going on very familiar roads, but far better to be dry than wet. Due to the rain we left quite late in the morning and immediately headed towards Kendal on the A590. We then turned North onto the A591 and passed around Kendal and then turned right onto minor roads to cut across to the A6 via Burneside. We did this to avoid Kendal as it can get quite busy at times. We then headed North on the A6, it was still raining and as we climbed up to Shap Fell the weather started to close in and visibility became very poor indeed. As we passed over the summit and headed towards Shap itself the weather started to improve and then suddenly we were on dry roads again. We continued on the A6 through Shap towards Penrith. 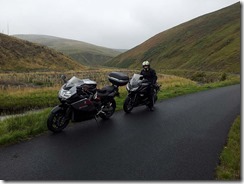 On the outskirts of Penrith we joined the A686 and headed for Hartside Pass. We soon started the climb up the pass and had a pretty clear run up to the top. They have resurfaced certain parts of the pass, but have put down a decent surface rather than the usual crap. We soon arrived at the top and stopped for lunch. Due to previous poor service we didn’t buy anything from the cafe and just had our own pre-made sandwiches. After lunch we headed down to Alston on the A686, they haven’t started to resurface this side yet so it is still quite badly chewed up at the top. In Alston we turned onto the B6277 and headed for Middleton-in-Teesdale. This is a great road, it has some nice fast sections and also some nice tight twisty bits as well. It is also a very quiet road and you often don’t meet any traffic until you get over towards High Force. We had a great run and only came across traffic after High Force but it was easily dispatched on the final run into Middleton-in-Teesdale. We stopped at Cafe 1618 as usual for a well earned cup of coffee. We left Middleton-in-Teesdale on the B6276 heading towards Brough. This is another very quiet and fantastically fast and twisty road. The only minor issue on this road is the sheep that you often come across on the road inbetween the two cattle grids, so always take it easy on this section and expect to find sheep in the road. We soon arrived in Brough and then joined the A685 to Kirkby Stephen. We continued on the A685 through Kirkby Stephen and towards Tebay. 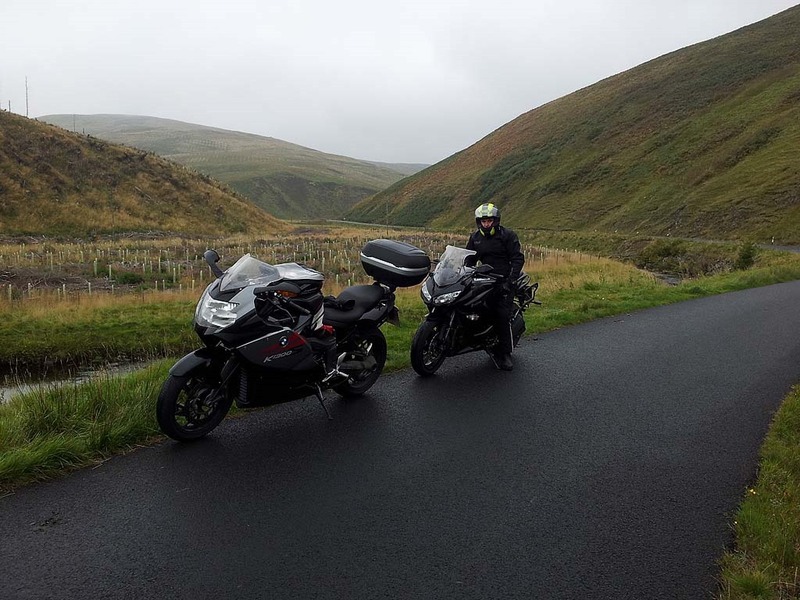 At some point along this stretch of the A685 we hit rain and wet roads again, this wet weather stayed with us for the rest of the ride back to Bouth. We passed through Tebay and continued on the A685 to Kendal. We then passed through Kendal and headed back to Bouth on the A591/A590. We had a much better weather forecast today and awoke to sun and dry roads. We decided to head over to Lowther and go for our annual visit to the Lakeland Bird of Prey Centre. 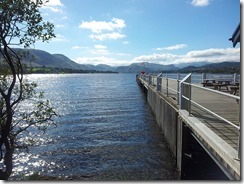 We headed trough Bouth and Spark Bridge and then joined the A5084 towards Coniston Water. This is a nice road and is often quiet as it is off the main lakes routes. However we did come across a few coaches on our way to Coniston. Fortunately we were able to get past, although I did feel sorry for the car drivers who couldn’t. We turned right at Torver onto the A593 and followed the road to Coniston. We then continued on the A593 all the way to Ambleside. In Ambleside we did the usual double shuffle and joined the The Struggle and headed for the summit of Kirkstone Pass. At the summit by the Kirkstone Pass Inn we joined the A592 and then headed down the other side of the pass towards Brotherswater. We continued on the A593 through Patterdale and Glenridding and followed the road alongside Ullswater towards Pooley Bridge. 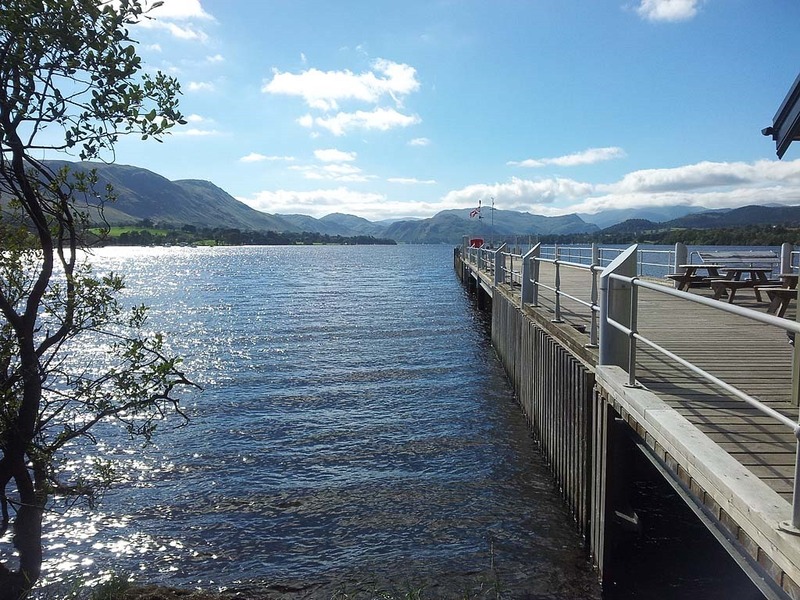 At the end of Ullswater we joined the B5320 and stopped just outside Pooley Bridge to take some photos. We then carried on through Pooley Bridge and then joined minor roads to cut across to Lowther via Askham. We arrived at the Lakeland Bird of Prey Centre in plenty of time to catch the start of the flying display at 2:00pm. The show was excellent as usual although Otto the Eagle Owl is getting too old now to be flown. The show is also getting predictable for us now as he flies the same birds and talks the same talk every year. But even so we would definitely recommend going and seeing the show as it is well worth the visit. 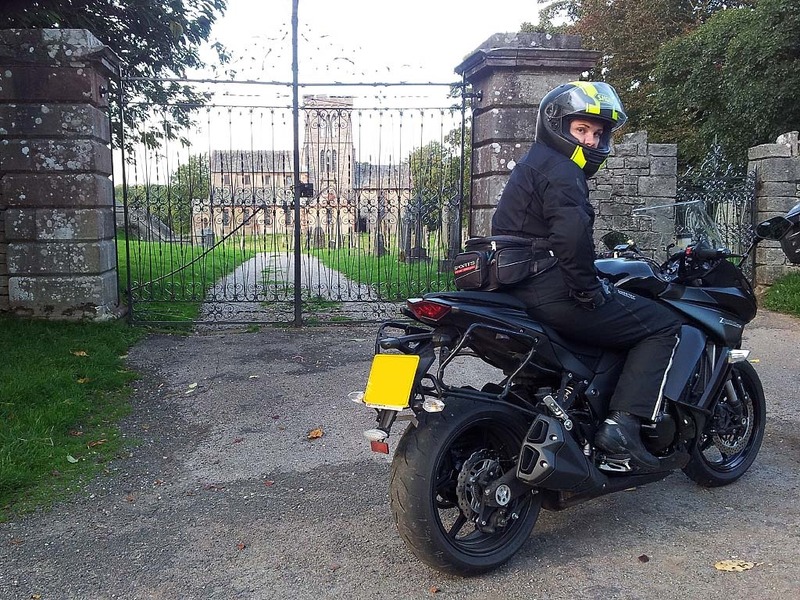 After coffee and cake we left and had a ride through the Lowther Estate and took some pictures near to Lowther Castle. We then headed back towards Kendal on the A6. We had a nice run today over Shap as it was sunny and the roads were dry and viability was good. 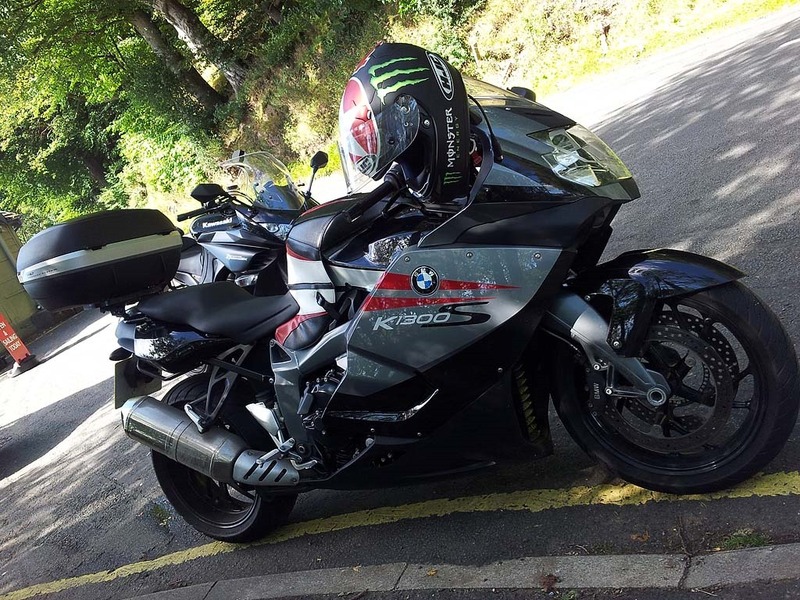 We cut around Kendal via Burneside as usual and then proceeded back to Bouth on the A591/A590. 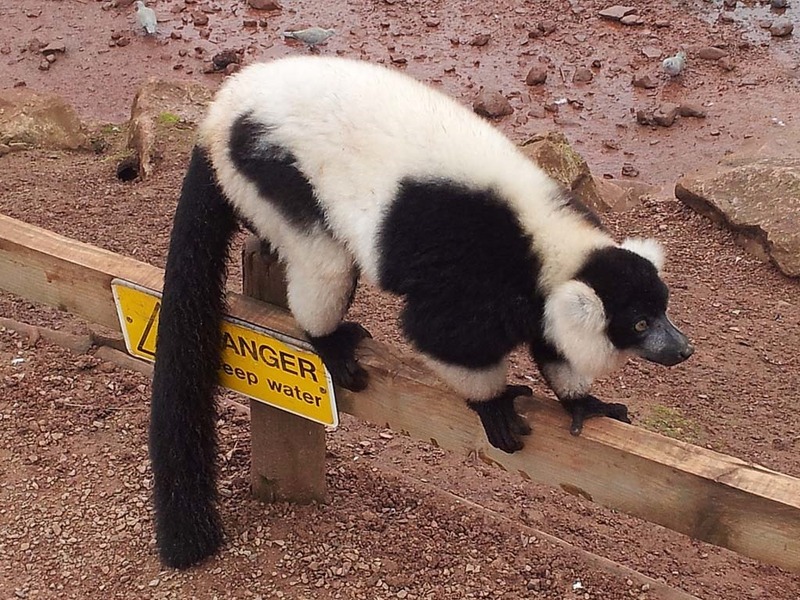 The forecast today was for light intermittent rain for most of the day so we decided to visit the South Lakes Wild Animal Park at Dalton in Furness. So we headed over to the park on the A590 via Ulverston. We thought that the car park wasn’t great for bikes and was on a slope, but actually there were plenty of decent places to park bikes in. It wasn’t raining but we took our small umbrellas in with us just in case. Nearly every 30 minutes they have something going on at the park, which usually involves feeding some of the animals and a talk. In most cases they let the public feed some of the animals for a small donation of £1 towards the Sumatran Tiger program. 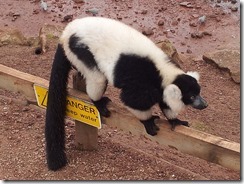 Helen decided that for £1 she would feed the Lemurs grapes. They came right up to her and took them from her hands very gently. We spent most of the day at the park as there is so much to do so it is well worth the entrance fee. 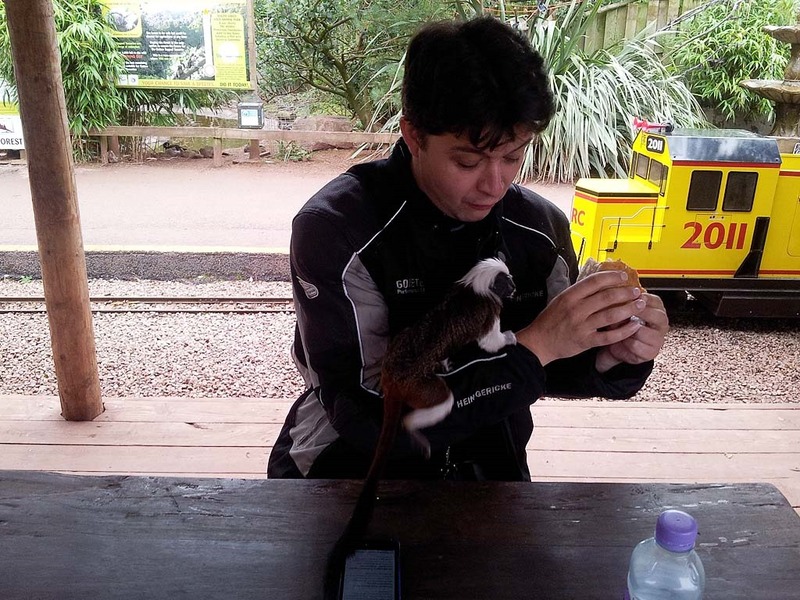 While we were having lunch a Tamarind got on my arm and tried to get to one of my sandwiches. But I managed to move it out of the way just in time. We left the park and headed over to the A5087 coast road. 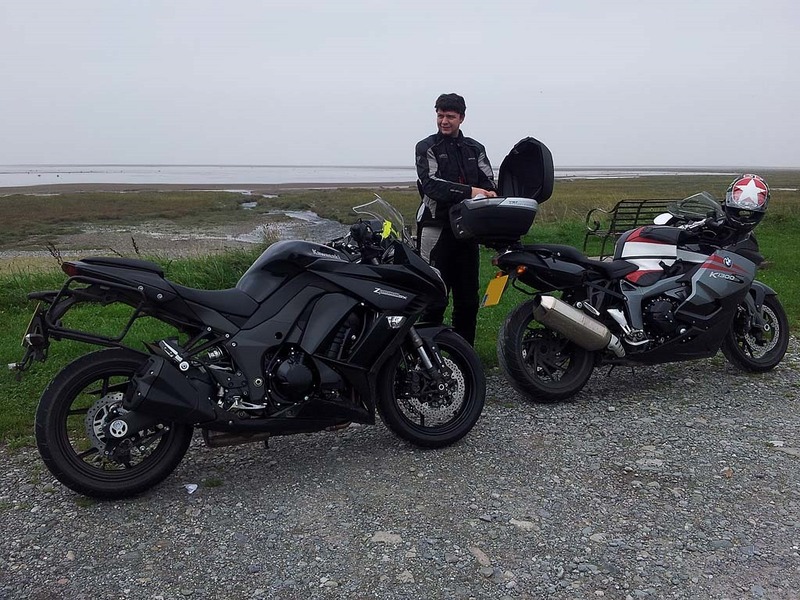 We then had a nice ride back to Ulverston on the coast road. We then headed back to Bouth avoiding the roadworks again on the A590. We decided to have a run into the Scottish Borders today as the weather looked reasonable for most of the day. We also haven’t managed to get up to Scotland this year so far on the bikes, so it was a must that we made the effort. We took our usual route to the A6 and then followed it all the way to Penrith. We then made our way through Penrith and then joined the A6 again and continued North. We then joined the M6 at junction 42 to make a bit of progress and followed it passed Carlisle and into Scotland, where it becomes the A74(M). We left the motorway at junction 21 and joined the B7076. This road runs Parallel with the A74(M) and is virtually as quick, but much nicer. We passed through Kirkpatrick and Ecclefechan on our way towards Lockerbie. Just before Lockerbie we turn left onto the A709 and headed for Lochmaben. In Lochmaben we joined the B7020 and headed north again. As we headed along this road we encountered a little bit of rain and damp roads but nothing to really spoil the ride. We eventually joined the A701 and headed into Moffat for some lunch. 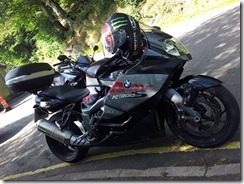 While we were stopped I topped up my bike with oil as the check warning had come on just before we arrived. We left Moffat on the A708 and headed towards Selkirk. This is a great road and even though it was a little damp it didn’t spoil it for us. The first bit of this road out of Moffat is quite bumpy so it is worth taking it easy as it can unsettle some bikes. But as soon as it opens up it becomes a lovely smooth open flowing road. 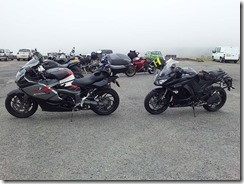 We soon arrived at St Mary’s Loch and stopped at the well know Glen Cafe by the Loch for a coffee. We left and continued up the A708 towards Selkirk but soon turned right onto the B709 at The Gordon Arms. This is a single track road that cut across beautiful open countryside towards Hawick. 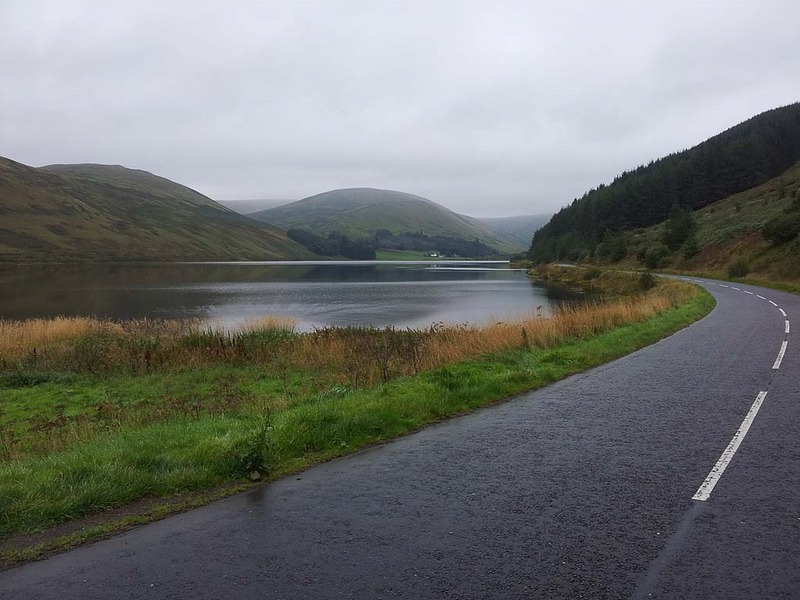 After a while we joined the B711 and ran alongside Ettrick Forest and then passed Alemoor Loch, where we stopped to take some photos. We then continued into Hawick and stopped at the new Sainsburys for fuel. As we arrived in Hawick it was dry and so were the roads, which did seem a little strange. We left Hawick and headed south on the B6399 and were soon back on damp roads. Again it didn’t really spoil our ride as the scenery is beautiful and the road was fairly quiet. The road follows alongside Slitrig Water and through Wauchope Forest. For the most part it is a double lane road but as you head further south it turns it a single track road with passing places, although cars and bikes can pass without stopping. 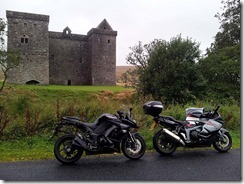 We soon arrived in Hermitage and turn right onto a minor road and headed over to Hermitage Castle. As we are members of Historic Scotland it was a free visit for us and we also knew it had toilets, so the perfect stop for us. Unfortunately as we got off the bikes it started to rain so we had to put our umbrella up. 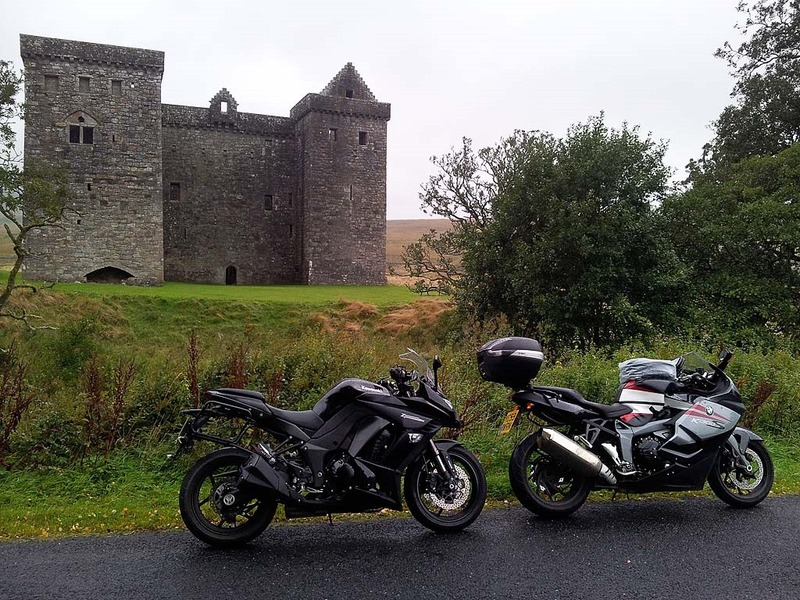 We had a nice visit around the castle and as we got back to the bikes the rain started to ease off. We left Hermitage Castle and rejoined the B6399 and headed south and soon joined the excellent B6357. 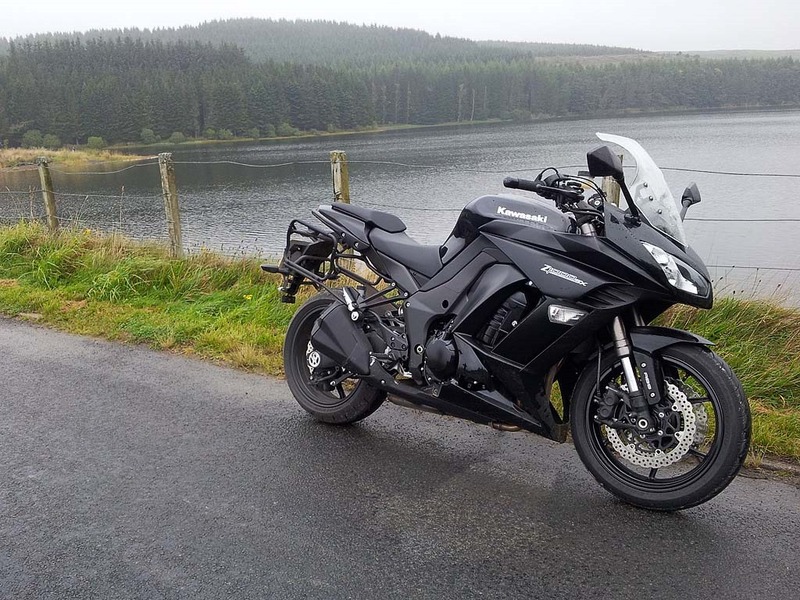 This is a fantastic fast flowing road and a great ride in either direction to Jedburgh or in our case Canonbie. We soon got back onto dry roads although the sky still looked overcast. The dry roads now enabled us to really appreciate this excellent road. We passed through Newcastleton and continued on the B6357 towards Canonbie. Just before Canonbie we stopped in Rowanburn at a lovely lay-by with a picnic bench to finish off the rest of our packed lunch. We then continued on the B6357 to Canonbie where we joined the A7 and headed towards Carlisle. We joined the M6 at junction 44 and headed south but left the motorway at junction 42 and joined the A6 towards Penrith. We then retraced our outward route all the way back to Bouth. 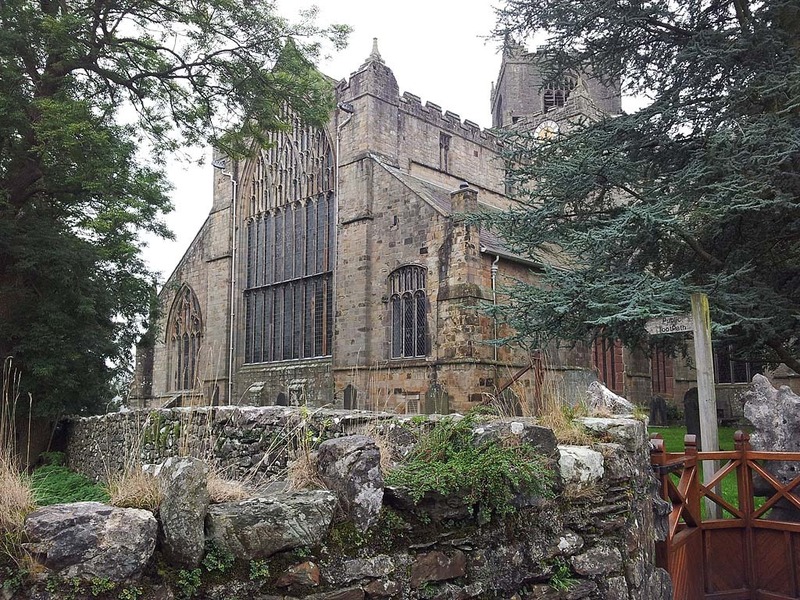 Today was Helen’s birthday and she had decided that she would like to visit Cartmel and Conishead Priory. We left Bouth and headed over to Cartmel on minor roads and we were able to park up in the centre of the village and avoid having to park in the pay and display car park. We had a quick look around the village and the Priory and even picked up a Cartmel Sticky Toffee Pudding from the Cartmel Village Shop. We left Cartmel and headed over to Humphrey Head as we hadn’t been there before. It was a nice quiet spot but there wasn’t really anything there so we didn’t stop for long. We then headed to Flookburgh where we joined the B5278 and then followed this road all the way back to the A590 at Haverthwaite. We followed the A590 to Ulverston where we joined the A5087 coast road. We stopped briefly at Bardsea for lunch in a nice spot by the sea. We then continued along the coast road and at the roundabout at the end we took the road to Roa Island. For once the sea was in and it was actually calm and not blowing a gale. The lifeboat station was closed as usual though, we have never been here when the station is actually open. 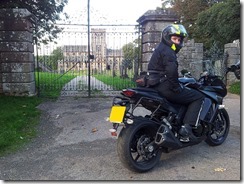 After a brief stop we headed back along the coast road to Conishead Priory. We had a walk down to the beach and then went to the excellent cafe for some well earned coffee and cake, before heading back to the caravan at Bouth. We had a bit of a lazy morning as we were just heading back today and not visiting anywhere on our way back. 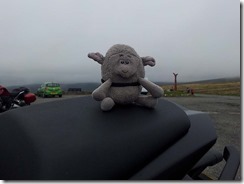 We left Bouth and headed on the A590 all the way to the M6. Here we joined the A65 and headed towards Kirkby Lonsdale. 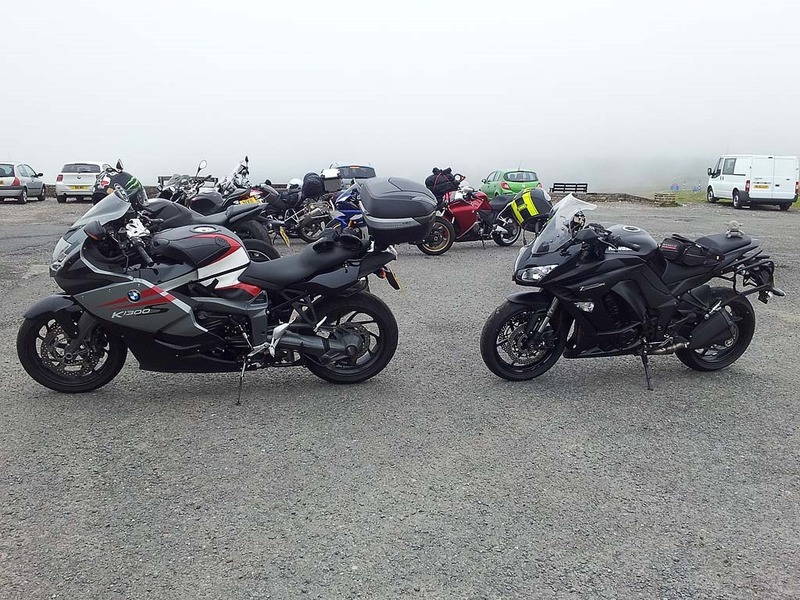 We stopped at Devil’s Bridge for a coffee and bacon butties, for once the cars out numbered the bikes. We left Devil’s Bridge and followed our usual way home from here. 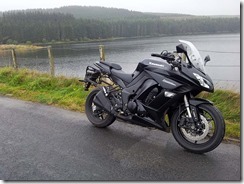 We headed over to Ingleton on the A65 and then turned off onto minor roads and went passed Stocks Reservoir and Gisburn Forest on our way to Slaidburn. Here we joined the B6478 and headed through Newton-in-Bowland and Waddington to Clitheroe. We then crossed the A59 and headed over Pendle Hill and through Sabden and then joined the A56/M66 and headed for home.